Morning Custard Lovers! Happy Easter. First up is Cupcake. Minxie has chosen the brilliant theme of Fluffy Bunnies! How cool is that? Bunnies or Easter are optional, but you do need to use some kind of fluff; pom poms, flower soft, fibres, whatever takes your fancy really. I decided to literally go for a Fluffy (love) Bunny, (this is my anniversary card for Very Understanding Hubby.) which I was cursing just after I coated the whole bunny in flowersoft and then had to recreate the wrinkles under the armpits etc! I also had the totally brilliant idea of doodling around the edge of all the white spots on the red paper! I was seeing spots after that, I can tell you! As it's Easter, we have treats for you. There are not one, not two, but three sponsors this week; Make The Day Special, The Stamping Boutique and Tickled Pink Stamps, in addition to our fab monthly sponsor, Bunny Zoe's Crafts. Over at Sketch n Stash this time, we're letting you choose whichever Sketch from the past 59 that you'd like. Brilliant, huh? If you'd like to win some stash from Jill, you'd best play along. Well, you've seen my card, why not pop over to Cupcake and Sketch n Stash and see the wonderful creations the rest of the girls have made! Morning Fluffy....What a lovely card. U Hubby will love it. You have worked hard on it, all that drawing on the dots and then the flower soft....Bet you need a rest and some choccie now!! I pinched some of my sons Lindt bunny yesterday when he was at the pub, put the paper back exactly afterwards, BUT he found out. I tried to blame it on the dog....but we don't have one!! wow! The Bunny is so cute and funny)) Love this card) It is vry joyful and well-done!!! Hi Fluffy....I think it took a lot of time to create this wonderful card for your VUH...but it was worth it...it is awesome! Lovely to have you with us again for this one sweetie. Just love this cute and furry bunny and those papers were the perfect accompaniment. Have you stopped seeing spots yet lol! Too cute! Love the dots! Happy anniversary! Aw! So gorgeous! How cute is this? Happy Easter! 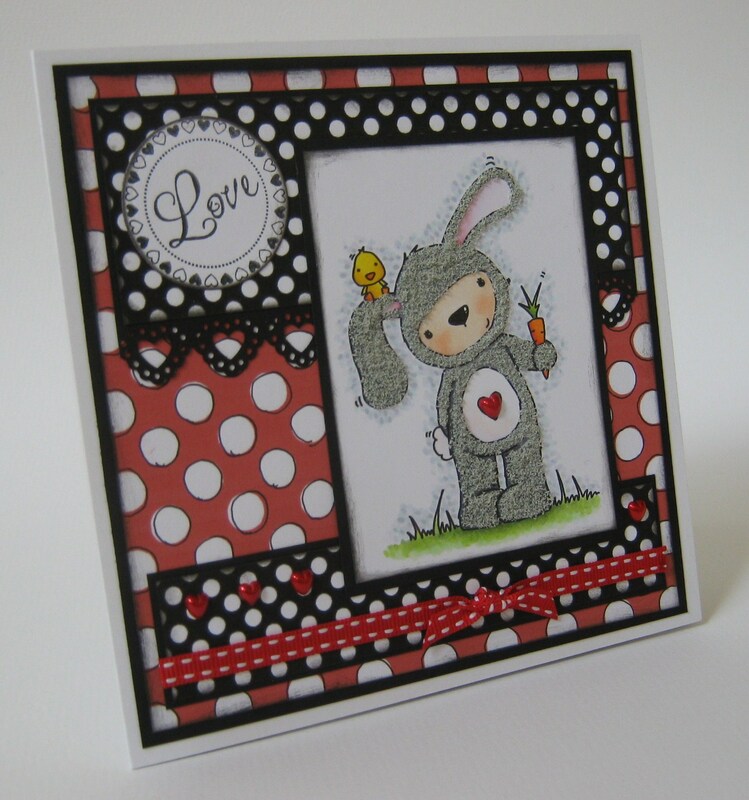 VUH will love this card I'm sure - the fluffy bunny is adorable and the doodling around the dots is inspirational! Hi Faye - cute card. Oh wonderful card Faye, what an adorable image. Wow fab card the bunny is adorable with the flowersoft. A gorgeous card Fluff and a fab colour combo. Awww, what a sweet fluffy bunny!! I have the hardest time using flowersoft....it hates me!! Your's turned out fabulous. I'm sure your hubby will love it. Ahhhhhhhhhhh! Did VUH love it? Loving the flower soft but feeling your pain re the wrinkles! Have you had your appraisal yet?! OOh look at the fluffness the bunny is adorable, fab card! !